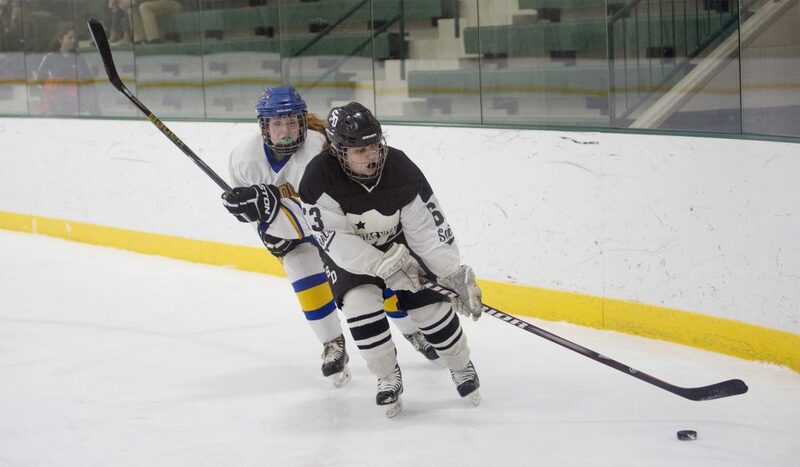 The Saints have a 28-game winning streak after shutting out Falmouth, 6-0. 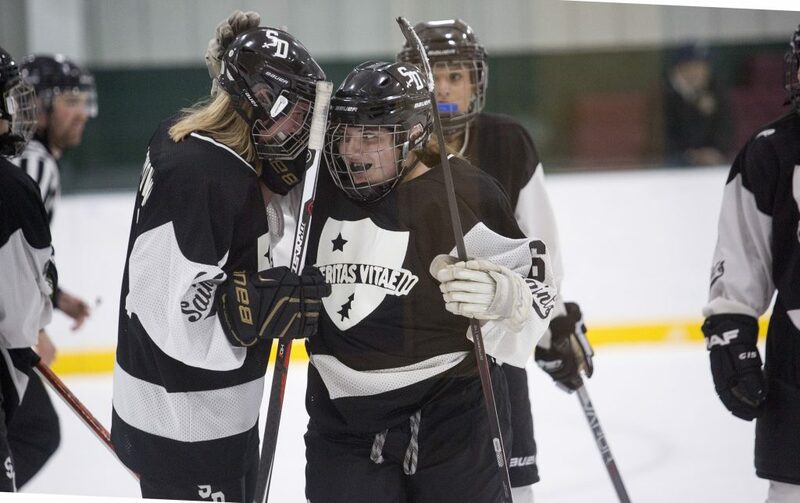 FALMOUTH — Don’t let the near-empty bench lull you into thinking the St. Dominic girls’ hockey team is struggling with barely enough players to play. 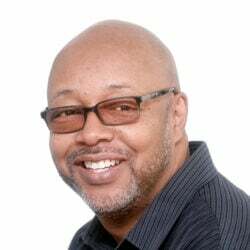 What the Saints lack in numbers they more than make up for it in talent. St. Dom’s, the two-time defending state champion, had 11 players suit up Tuesday night, traveled to Falmouth – the team it beat in last year’s final – and totally dominated in a 6-0 victory at Family Ice. The victory was the 28th straight for the team from Auburn, which is 2-0 this season. The Yachtsmen dropped to 0-3. 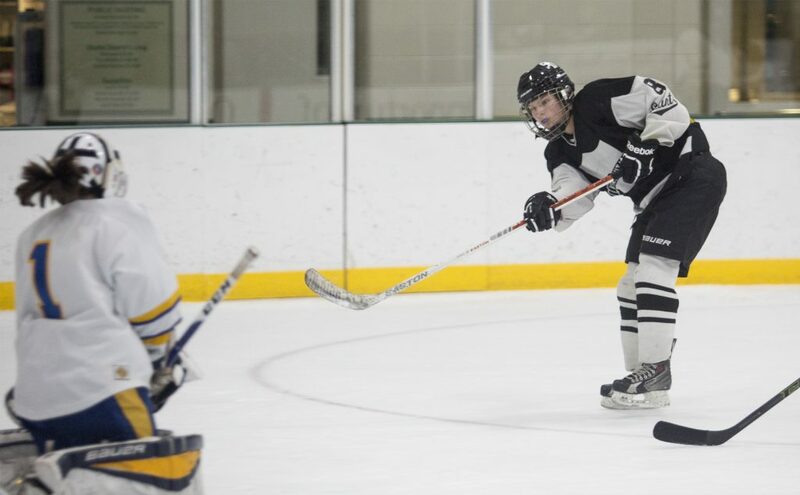 Avery Lutrzykowski led St. Dom’s with five goals, including the first five. 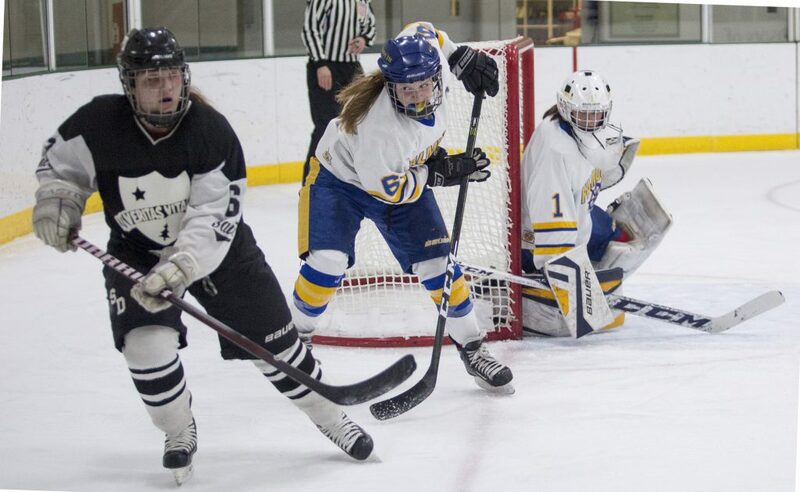 Madison Samson also scored, Emma Theriault chipped in with two assists and Katya Fons had one. Falmouth Coach Rob Carrier places Lutrzykowski in a small class of players that you have to keep your eyes on at all times. “I put (Lutrzykowski) and Courtney Sullivan (of Greely) in that shifty, elusive type player,” Carrier said. The Yachtsmen played even with the Saints for the first half of the first period, but Lutrzykowski came up with three goals in a 1:48 span to give her team all it needed. First, with 6:14 left in the period, she poked in a rebound of a Theriault shot. Fifty-six seconds later she converted a breakaway from center ice when she deked right and slid the puck in the open net. She then completed the hat trick when she won a faceoff in the offensive zone and placed a quick shot in the far top corner. “It was definitely important to come out strong and score a couple goals so when in the third (period) when it matters most we don’t have to worry (as much),” said Lutrzykowski, who has nine goals in the first two games. “Once one goal goes in, (then) two go in, three go in, and then they start falling. 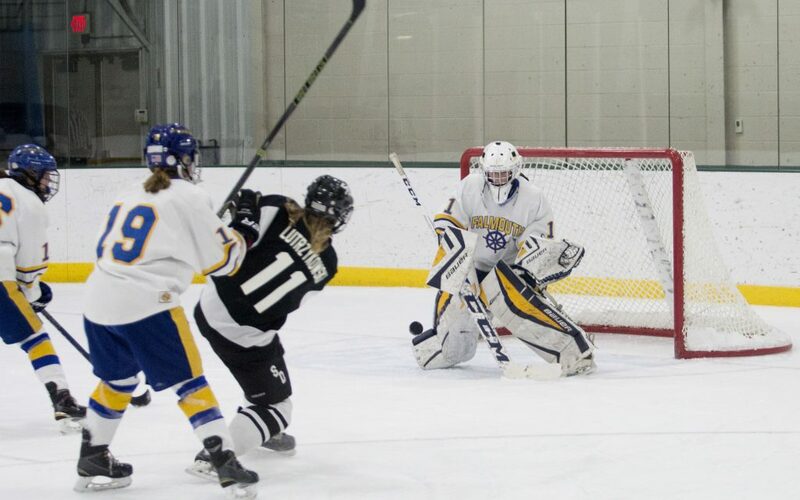 Lutrzykowski added two in the third period, the first between the goaltender’s leg, with her fifth of the game following a little more than 21/2 minutes later when she picked up the puck at center ice and scored from between the faceoff circles with two defenders on her. Callie Samson capped the scoring with 3:55 left in the second period when she jumped on a loose puck inside the blue line and scored from the right faceoff circle. Payton Winslow stopped 10 shots for the shutout. 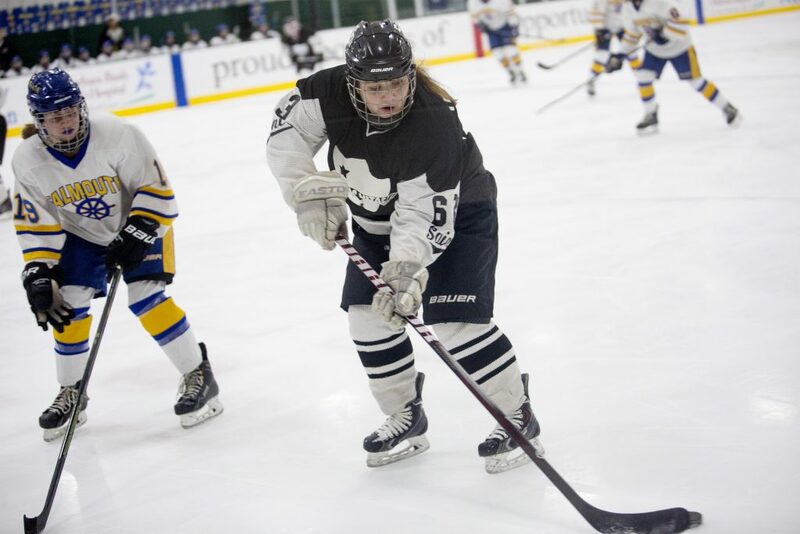 The Yachtsmen received strong games from defensemen Abi Lebel, who had a few scoring opportunities, and Kayla Sarazin, who constantly thwarted scoring chances with timely poke checks.